For James Clark of the Mille Lacs Ojibwe community, who was educated in Indian boarding schools, leaving home was an easier transition. 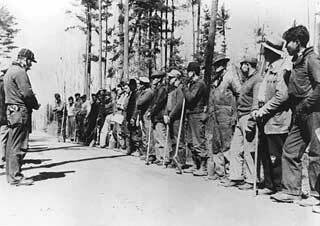 American Indians in Minnesota had an opportunity to work with the CCC Indian Division (CCCI). Mr. Clark worked at Grand Portage and Nett Lake Camps. He was interviewed by Dr. Anthony Godfrey in 1992 as part of the Mille Lacs Ojibwe Social History Project. AG: Do you remember your first day at camp, arriving at camp? JC: The one in Grand Portage. JC: Yeah. There was four of us from Lake Lena went up there, and they told us to go up to Grand Portage. We went up there on a bus; we had to pay our own fare. From Duluth -- we went on a train from Danbury to Duluth, and we took a bus from there. We had to walk the last mile or so. AG: Into camp? Uh-huh. So it was already established? JC: Yeah. It was already there. But we got over there in the evening. They fed us, and they put us in a temporary room, where we slept that night. Then the next day, we were assigned beds in barracks and different groups that we had to go with. The first day was generally getting oriented to what they were doing. I remember that pretty good. AG: Was it kind of different living in a barracks for the first time with a bunch of other guys? JC: For some guys, it was -- not to me. AG: Did you have lodging experience where you had bunked-up? JC: No, because I went to boarding school. JC: I was always with a bunch of guys -- lived with, lived among guys -- so this was nothing new to me. And even when I was in the service -- when we were in boarding school, we had to learn how to march. We had to drill, so we -- I was pretty much up on regimentation living. 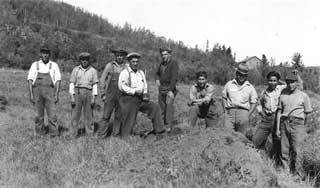 Indian Civilian Conservation Corps crew on stockade site at end of first day's work, Grand Portage, 1937. 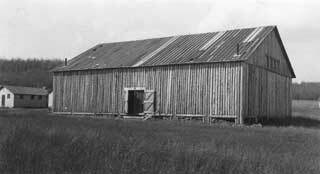 Civilian Conservation Corps camp recreation hall, Indian Division, Grand Portage, 1937. 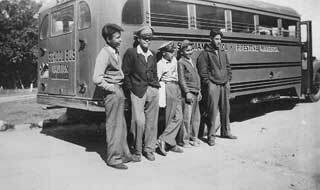 Mille Lacs students leaving for Pipestone Indian School, 1940.